Watch movies and play games with stunning colors in any environment. 3,000 ANSI lumens combined with a sharp contrast ratio enable a near perfect reproduction of the REC.709 color spectrum, the international standard for HDTV viewing. Sharper more detailed projection with 1920 x 1080 pixels, perfect for watching Blu-ray movies without downscaling or compression. With an extended lamp life of an impressive 8,000 hours, even if you watch a two-hour movie every day, your projector’s lamp should last over 10 years. Complete your home entertainment experience with the convenience of a powerful built-in 10W speaker. This speaker provides powerful, crystal clear sound quality without the need for costly external speakers. Combined, these features create colors that are perfectly aligned to REC.709 and REC.709b color space, a color spectrum that is bright and accurate. The visuals it creates conform to HDTV broadcast ColorSpace specs and transform viewing into virtual reality. 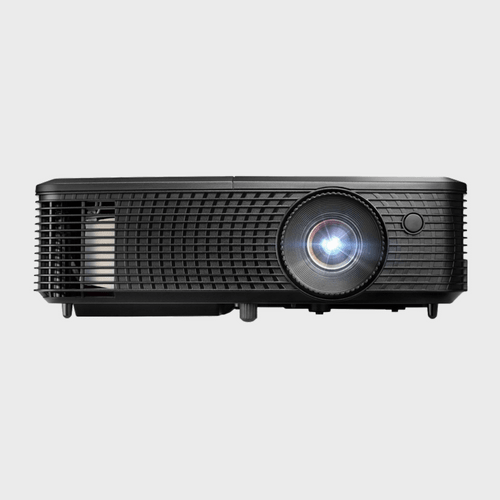 Optoma projectors can display true 3D content from almost any 3D source, including 3D Blu-ray players, 3D broadcasting and the latest generation games consoles. And the projector’s support for 144Hz rapid refresh rate provides smooth, flicker-free images. Images are automatically adjusted to lamp output, based on the brightness information of each frame, creating one of the home entertainment industry-leading 23,000:1 contrast ratio.